That fitting occurred in several parts. By now we each had the body of our jackets sewn together, and the next step was fitting our sleeve muslins onto those “vests” as we so fondly referred to them. All manner of changes needed to be made to those sleeve muslins – shoulders lengthened or shortened, bulk added or subtracted to the widths, armholes tightened or loosened, lengths of sleeves adjusted for full-length, bracelet length, or three-quarter (purely a personal choice, another part of the custom aspect). Lucia decided on three- quarter length sleeves, with no plackets, but double rows of trim. One of the elements of these jackets which makes them so custom is the unusual “sectioning” of the sleeves. The sleeve in the basic Vogue pattern is a two-piece sleeve. However, the sleeve in one of these classic French jackets is a three-piece sleeve. Once we had our muslin sleeves fitted, re-marked and taken apart, Susan showed us how to split the upper sleeve pattern piece into two sections, (1) to create a seam on the outer arm which facilitates fitting and helps to create shaping at the shoulder, and (2) allows for the addition and proper placement of a placket at the cuff for trim and buttons. 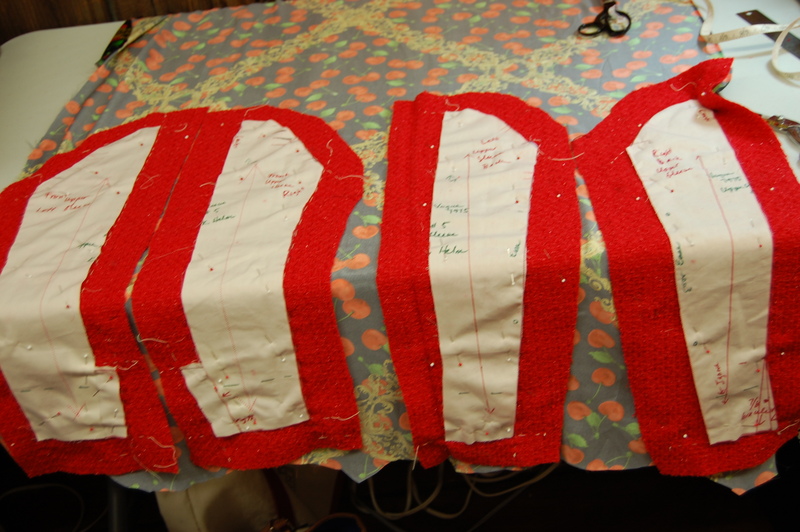 This photo shows the new pattern pieces for the top section of the sleeve. On the left, note the addition of “plackets”. For a close-up, click on the photo. Once we had our new pattern pieces, we were able to cut out the fashion fabric and the lining and proceed with quilting the two layers together. After sewing the seams in the sleeves, we proceeded to finish the interior lining sections, paying special attention to the placket area. 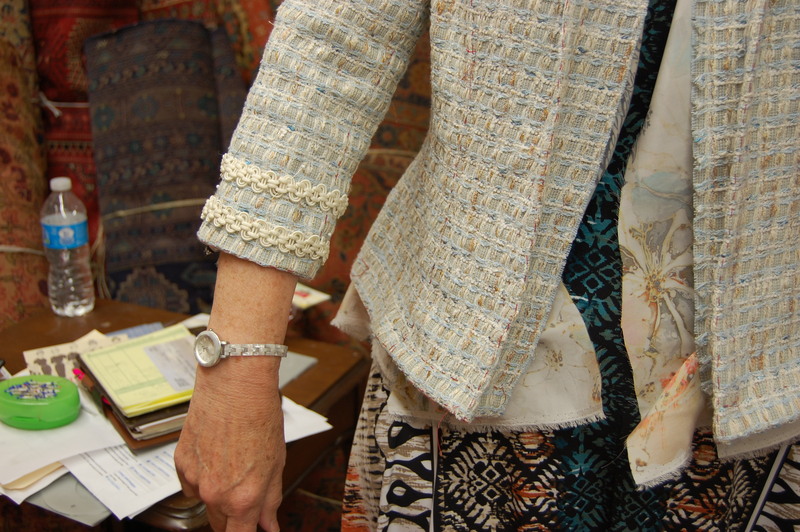 Then back we went to more fitting, specifically fitting our newly constructed sleeves onto the jacket. First the shoulder sections of the sleeves were pinned in place by Susan. That seam on each sleeve was sewn using a fell stitch (waxed, double thread), working on the outside of the jacket. Susan fine-tunes the shoulders of Myra’s jacket. 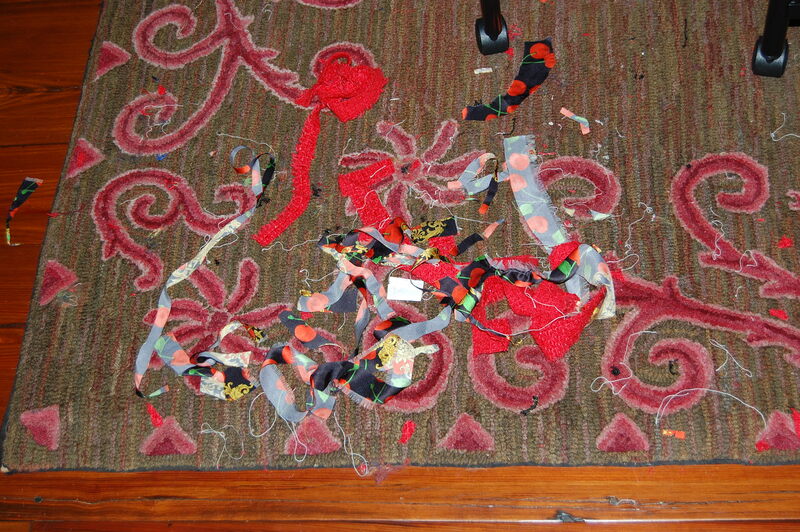 Numerous fittings followed, redoing the stitching as required, sometimes numerous times. After the shoulder seam, we turned our attention to the lower armscye. 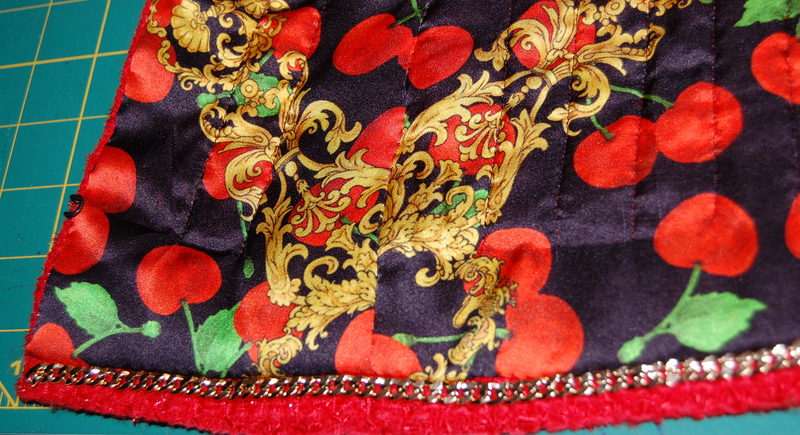 This stitching was done with a backstitch on the inside seams – and yes, it was a process of trial and error (mostly error – or maybe I should say, “refinement”). Once my sleeves were sewn in place, with no buckling, no bulges, no gaps, fitting “seamlessly” with the body of the jacket, I felt like I had accomplished something close to miraculous! 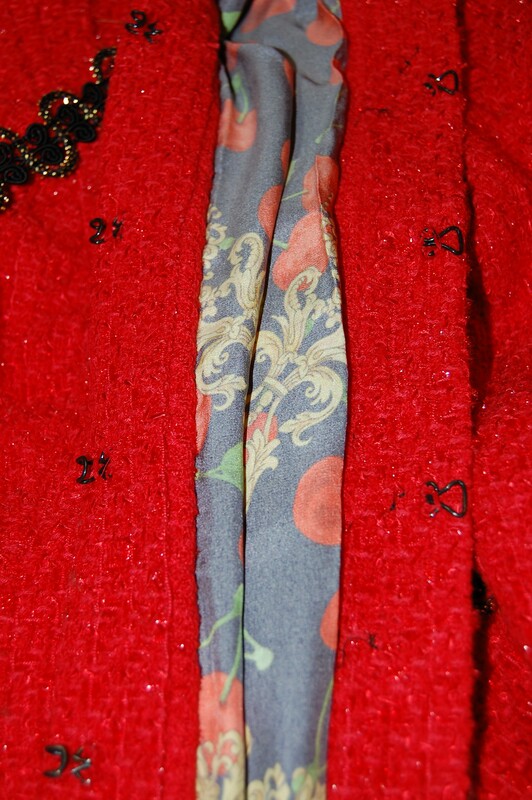 The hooks and eyes are placed on the front edges of the jacket, to insure an “abutted” closure. 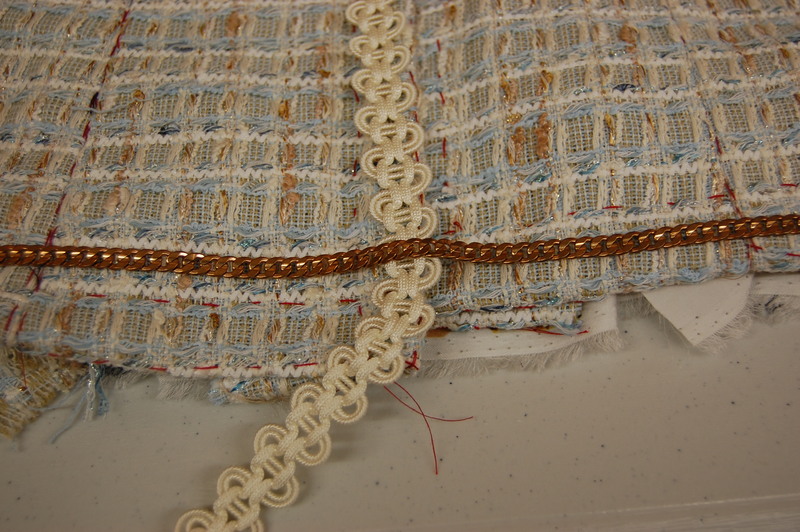 5) finishing the interior edges – by fell-stitching the lining to the edge of the jacket. 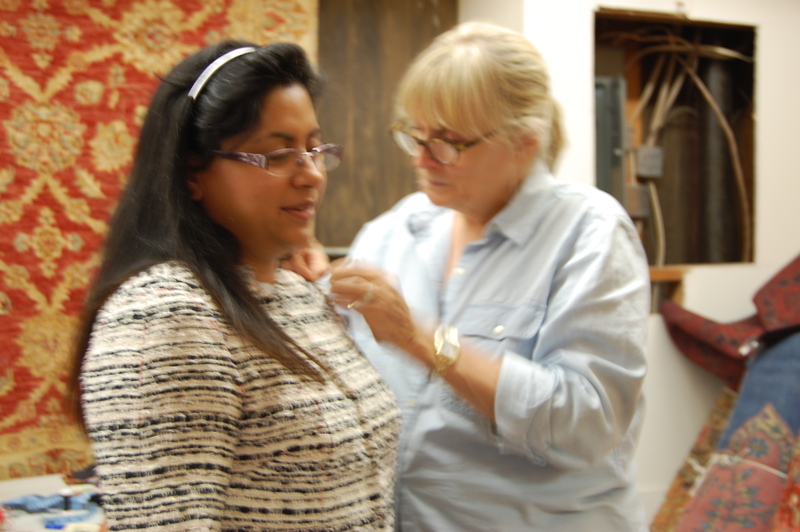 Susan helps Myra pin pocket templates onto her jacket. 10) finally, sewing on the chain, which anchors the jacket, insuring that it will hang straight; its weight is a very subtle, lovely reminder of the “haute couture” aspect of this creation. Lucia chose this “copper” colored chain . . .
. . . while I chose a gold chain. “. . . In modern France, haute couture is a ‘protected name’ that can be used only by firms that meet certain well-defined standards. However the term is also used loosely to describe all high fashion custom-fitted clothing, whether it is produced in Paris or in other fashion capitals such as London, Milan, New York, or Tokyo [or Baltimore! (my italics and brackets)]. Well, from Baltimore, we all returned to our respective homes across the country, where sewing rooms and spaces must look something like mine – scattered with bits and pieces of all that finish work on our Classic French Jackets! The hooked rug in my sewing room, covered with “cabbage” from my Classic French Jacket. Part Three – Fashion Show! To be continued . . . This morning I jumped up at breakfast. Yesss, part two of Paris in Baltimore showed up on my iPad! Thank you so much for sharing, you gave one Dutch girl a wonderful start of the day! Can’t wait to see your finished jacket, although I enjoy reading about the making too. And you, Marianne, gave this American girl an equally wonderful start to my day with your lovely comment! Thank you! you also gave a Norwegian girl a wonderful start of the day! You have inspired me to take a class with Susan too. 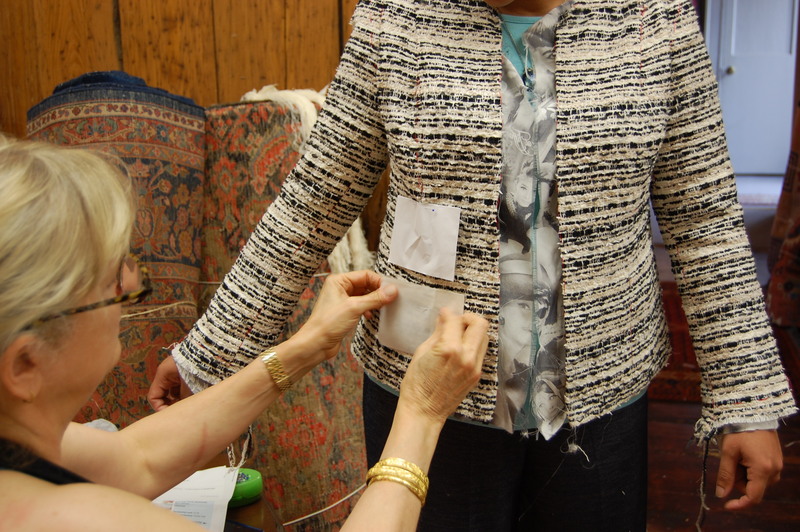 I hope to fly over next year to join a group of wonderful American ladies sewing Chanel jackets! I have been reading your blog for quite a while, but am new as a follower. The best sewing blog I know. I am so excited that you are planning on taking Susan’s class, Aud! It was a truly wonderful experience for me, and I know it will be for you, too! Your comment means so much to me – thank you, thank you, thank you! The class looks amazing! I’m definitely jealous! I look forward to seeing your chanel style jacket! I’m so glad you’ve been posting about our class! It was such an amazing and unforgettable experience. I can’t wait to see your finished product! This is like reading one of my favorite mystery novels. The details! The intrigue! The suspense! I’m so enjoying these posts on your time with Susan and I can’t wait to read the last chapter. Karen, wonderful read as always! I am really enjoying reliving the experience through your posts. Looking forward to the fashion show!! Thanks, Myra! The fashion show will happen soon! Karen, I have loved being able to relive the week of the class with your writing. Perusal of earlier blogs has been a treat for me as well. You have a lovely style of expression making for an enjoyable read! I am getting ready to start the second one soon I think. Can’ t wait to see your jacket. Oh, Sherry, it’s easy to write about something that is so enjoyable and creative! Also, I think writing my blog makes me more aware of the process of sewing than I would be otherwise, so it’s a win-win situation. So – tell me, how many Chanel-inspired jackets do you think one person can make/own? So great to hear from you! I am rather late to the party but thank you too for so many wonderful words details….. One day, perhaps, I will be able to attempt such a project but until then I remain intrigued by the story of yours.